and we’re going bowling because of your generosity! Excitement for the opportunity to help others grew quickly as the PE teachers announced that the PE CARES Food Drive would begin on Wednesday, November 1. Some students bought food items using their own money. Other students collected food items from their neighbors. Families worked together to gather food from their pantries or road trip to the local grocery stores. In the end, 1,012 food items were collected by the students and families from our classroom. These were added to the massive amount of food items donated by other classrooms that lined the hallway outside the gym. We had a great year of giving for PE CARES!!! 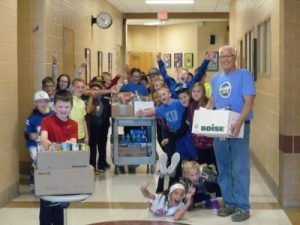 GT elementary students and their families donated 3,987 items to Love Inc. in Hudsonville. Thank you all for supporting this very worthwhile cause. Mr. Kooikers class collected the most and will be given a PE CARES bowling t-shirt and taking a field trip to Hudsonville Lanes in the near future 🙂 Way to go!! !